Classes and crops are designed for adult participants unless otherwise noted. Call the store to reserve a spot, then come on in and scrap. Bring your supper, snacks and supplies. Use our tables and tools.The store us open until midnight so you will have plenty of time to work on your projects. On the rare occasion that no one has signed up for the crop by Thursday night, we may cancel the crop. Signing up for classes or crops requires pre-payment; please call or stop by the store to sign up. Fees are non-refundable. IMPORTANT: Classes by store teachers must be canceled 48 hours in advance for a store credit less 10% fee. Within 48 hours a kit will be available. On out of town designers, classes are non refundable due to the up front expenses of having them come to our store. If you need to cancel you may sell your spot or if we have a waiting list we will try to sell it for you. Please bring the following with you to class; 12" paper trimmer (one that measures in 1/8" increments), small detail paper scissors, larger scissors for cutting ribbons and such, wet and dry adhesive, pop dots, paper trimmer, Crop A Dile, black pen, pencil, sanding file, ink blending tool, heat tool, paper piercer, Exacto knife, and corner rounder. Please bring a craft mat if you have one. Come learn how fun die cuts can be when used to make incredible scenes. In this class, we will use dies from Impression Obsession, Lawn Fawn and Elizabeth Craft Designs. 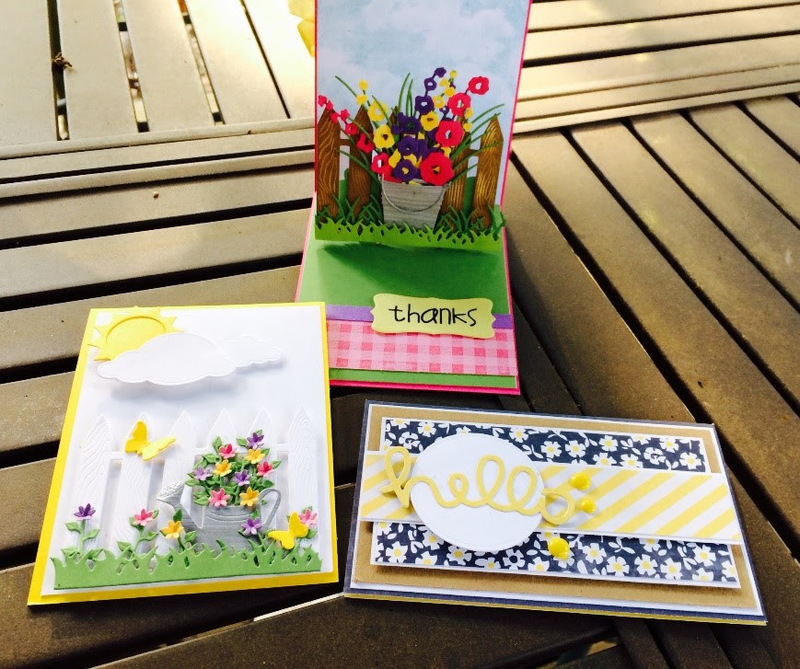 You will learn how to build scenes, layer die cuts, color and ink die cuts, as well as make a Pop Up card from Karen Burniston for Elizabeth Craft Designs. 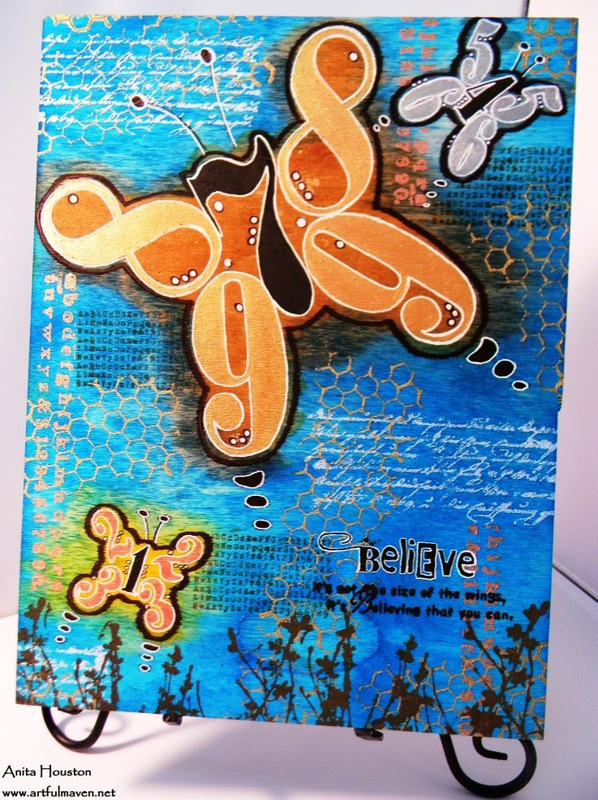 In this class you will alter one page (front and back) of a Wendy Vecchi Art Journal Cover Page. 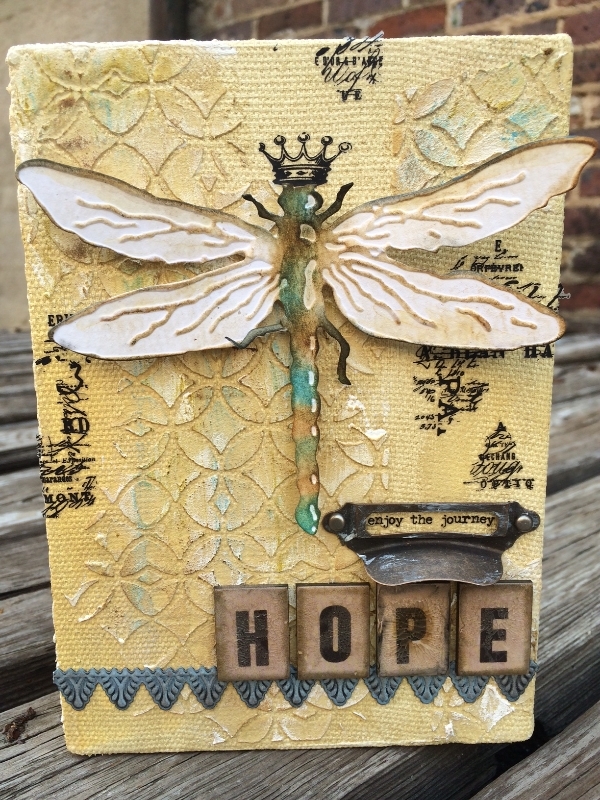 Some of the products you will use in class are vintage papers, The Crafters Workshop stencils, Wendy Vecchi Studio 490 Gold Embossing Paste, Dina Wakley Scribbly Birds stamps and Dina Wakley Media Paint. Page one is full of texture, muted colors and accented with a wooden cameo, seam binding bow, vintage rickrack and inspirational words stamped onto vintage paper. Page two is bright and whimsical. You will see how simple it is to create silhouettes and hand painted whimsical doodles. The tips and techniques you learn in this class can easily transfer into any of your future projects. Come and join me in creating this fun album! Each set of pages has a pocket to place a gift card, a note or quote for a special friend or a keepsake just for you! 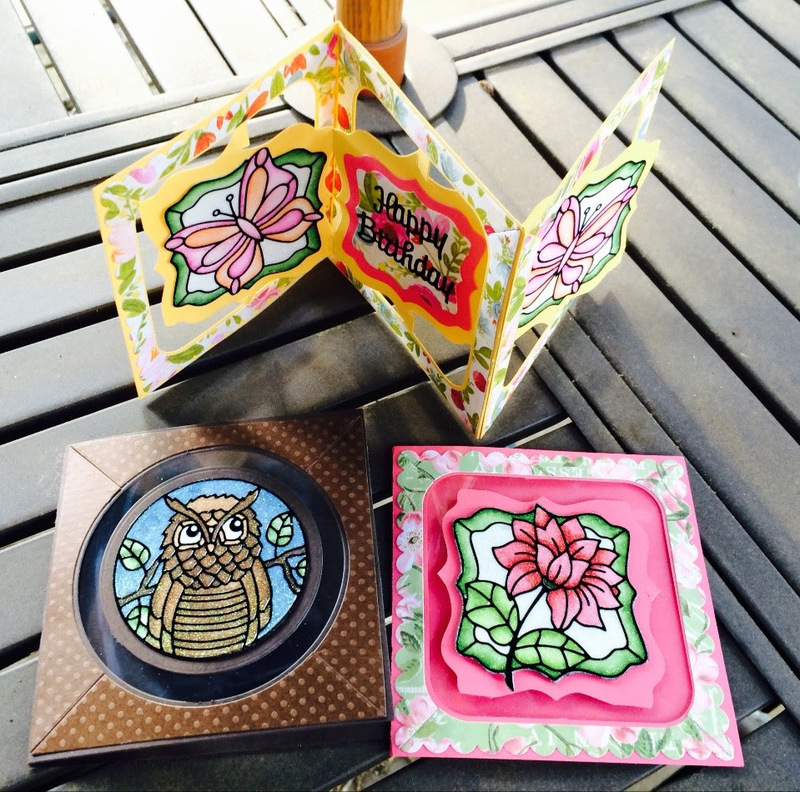 Come learn how to make FUN interactive cards with Elizabeth Craft Designs Accordion Album dies. We will also be using Elizabeth Craft Designs peel off stickers and glitter. You will learn how to color on glitter using Copic (or Distress Markers). Students supply: tape runner, scissors, tweezers, bone folder and various colors of markers (I use Copics but Distress Markers will work as well) If students are using Copics they will need a colorless blender. 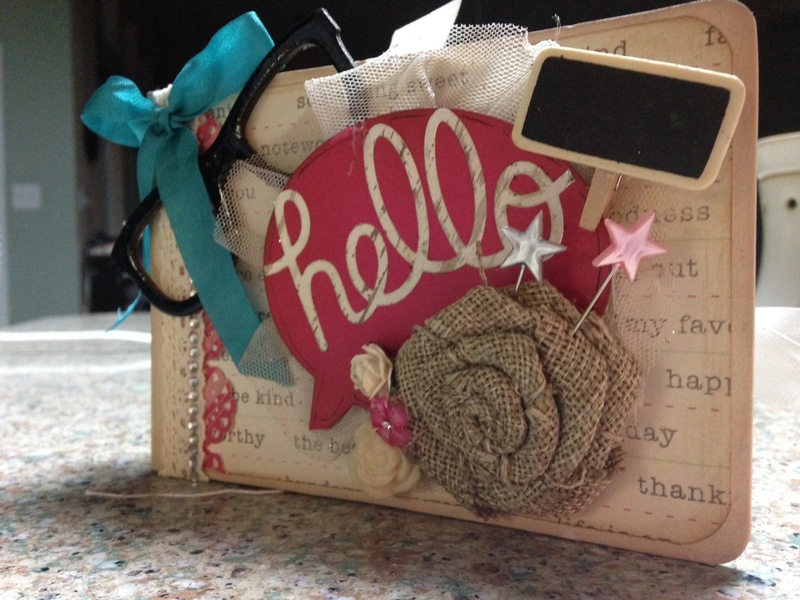 Have you seen Tim Holtz new Alteration embossed/dies? You will be learning how to color and shade with the distress markers, Wendy Vecchi's embossing paste, distress paints and stencils, all on a 5x7 canvas. Supplies: non stick craft mat and adhesive. My sweet friend, DT member and teacher Anita Houston, is coming back to teach in July! If you love learning new techniques and not having to bring a ton of stuff to class, you will love Anita's workshops. Anita is the one that designed and taught that amazing Christmas village last year, and hopefully will bring us another one this fall. If you are out of town and coming for both days, be sure and call the Comfort Suites and tell them you are with the Crafty Scrapper to get our corporate rate of $59.95, 469-517-1600. It’s always interesting to take numbers or letters and make pictures out of them, but instead of doodling them out on a memo pad while talking on the phone, you can create a piece of Art to cherish for years to come using those same doodles. In this class, you will create a whimsical and fun piece of Art that has so much character. You will use paint and ink sprays on a 9x12 inch wood panel canvas, which adds to the interest as you can see the grain of the wood, giving the piece a textural quality like nothing else. Students Will Need: Scissors *Note: You will be using Dylusions Ink Sprays, so you might want to wear an apron. Most of us are able to go on a vacation at one time or another. It's nice to have the trip documented by having photos and journal entries in an album to show off. 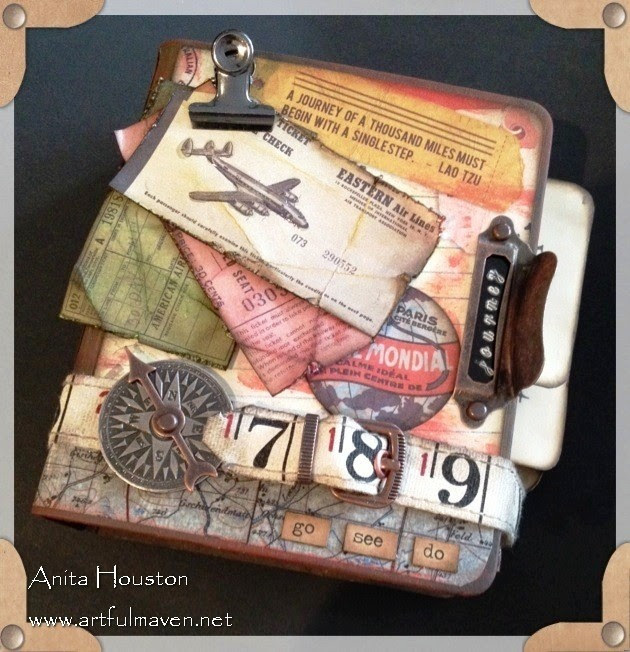 In this class you will make a travel mini album in vintage style. You'll learn to shabby things up and extend pages, as well as use gesso to toughen up paper and fabric. Your memories of a wonderful trip will be showcased in pure grungy style! 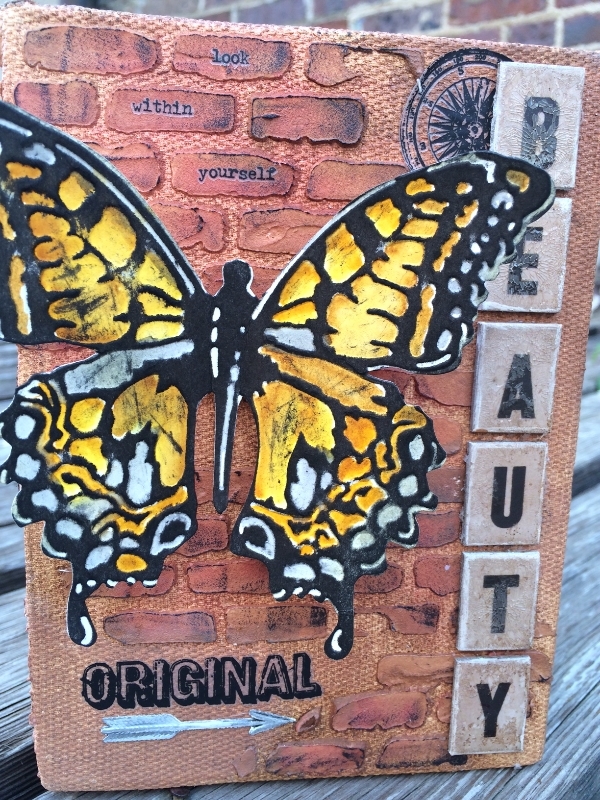 Have you seen Tim Holtz new Alteration embossed/dies? You will be learning how to color and shade with the distress markers, Wendy Vecchi's embossing paste, distress paints and stencils all on a 5x7 canvas Supplies: non stick craft mat and adhesive. We are so excited to have Anita Scroggins bringing a series of Silhouette Cameo classes to the Crafty Scrapper! During this class we will learn basic techniques for using your Silhouette Cameo such as blade adjustment, cut setting, sizing shapes, and organizing your library of files. We will complete a small project for practice. Students should bring with them: Paper cutter, 2 Silhouette mats, Silhouette Tools (scraper, pick took), liquid glue. tape runner, and cardstock for making practice cuts (this is a great time to use up those colors you bought but now you can't figure out why). Paper to create the project will be supplied. Of course you will need your laptop and your Cameo, with the latest Cameo software installed. In this class we will work with layered designs; how to separate them to work with, how to lay them out on your mat to make the least amount of cuts, etc. We will complete a small project for practice. Are you tired of cutting out your stamped images? During this class you will learn how to create your own cut files using scanned images. These files can then be used in other programs that support SVG files. We will be working in the Silhouette Studio software. Prior to class students will need to scan two stamped images. Stamp a medium sized stamp (@ 4x4) using black ink onto white cardstock and scan. Choose a simple design that is one single image for the 1st scan, and a more complicated design that maybe has individual pieces for the second. I will also have images we will learn on. Signups are open $70 deposit. Includes class kit and giveaways. Meals are included Friday night dinner, Saturday breakfast, lunch & dinner, Sunday brunch. Arrive at noon Friday, check out is Sunday 3pm. *NOTE Our House has gone up $15 on their prices.